Looking for Bali’s Best Wedding Planner for Your Destination Wedding? The growing trend of the ‘destination weddings’ in Bali seems ideal for the most romantic and heavenly day of your life. However, couples that try to plan their own destination wedding are often caught out by unexpected planning surprises and blow out costs that easily overtake the happiness and excitement of organising their magical day. Basically, things go very pear shaped! Our days in event planning in some of Seminyak’s most popular venues saw us cross paths with brides and grooms from Australia, struggling to collaborate with local suppliers to get everything together. This is where our team saw a growing need to create affordable wedding packages for Australian couples wanting to get married in Bali. The main barriers we discovered for these couples were finding trusted top quality local suppliers, keeping to their budget and not loosing those fine details in translation. Far far too many Australian couples were getting burnt in Bali by unscrupulous wedding planners. And so Your Bali Wedding was born. Our vision was clear; to make the lead up to the wedding as enjoyable and memorable as the day itself. So how do we do this? How do we drain the wedding planning strain? We have long established relationship with the islands top quality local suppliers, musicians, caterers, photographers, dress makers, bakers, to the most exclusive private villas. This means we will be able to customise every aspect of the wedding to see your dreams come true – at the best price! Before you arrive in Bali you will be able to organise unlimited Skype and phone call appointments with your wedding planner to discuss your ideas so we can create a unique style and concept for your wedding. You will be amazed with how Your Bali Wedding can create a personalised romantic ambience with the finest flowers, linen, remarkable centrepieces, atmospheric lighting, lanterns, screens, lounges and many more pieces. Once you get here you’ll have continued unlimited face 2 face appointments with your wedding planner as needed. We completely coordinate and manage all contracts, bookings, deposits and balance payments for venues and chosen suppliers. This means the only thing you’ll have to worry about is where to get your next traditional Balinese massage. We want to create a wedding that uniquely represents you and your fiancé as a couple. 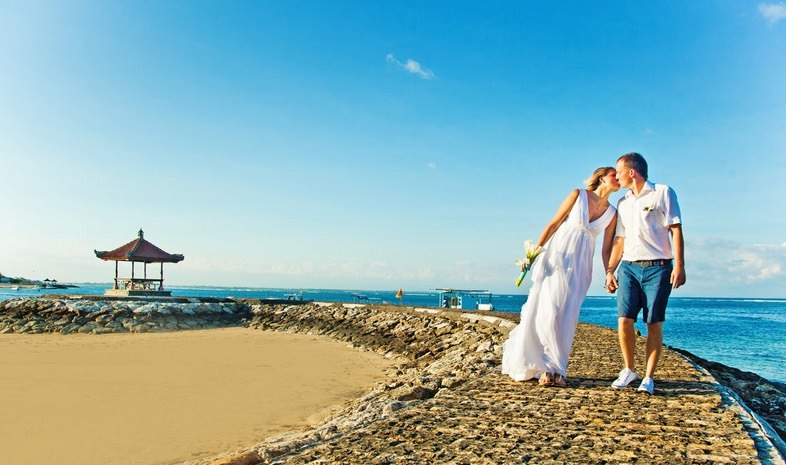 Whether you are after a beach side wedding overlooking the crystal clear water crashing onto soft white sand or a ceremony incorporating the ancient traditions of the island into your contemporary reception, no dream is too big. We will personally help you find the right venue and organise site tours as needed. We will also help you find the right area in Bali for your wedding. Do you prefer a Seminyak or Canggu location for your wedding or would you like to be near Jimbaran or Uluwatu. Locations are really vital and we will definitely be able to help you decide on the best location. We fully appreciate the importance of keeping within your budget. This is why we will keep you constantly in the loop with detailed costing so you can track the financials along the way. If there are any changes to the plan we can easily re-evaluate things for you staying within the budget. We have the most state-of-the-art online wedding platform which means you can see everything we are doing, all costs and the entire wedding planning process online in real time. From our experience the most pain staking process of wedding planning is figuring out where to seat all of your friends and family. You surely do not want to offend anyone, even the most distant of relatives that your mother forced you to invite. Being in the wedding planning industry for over a decade has given us insight into how to make all your guests comfortable and happy on the day. We assist with all aspects of floor plans and seating arrangements along the way. On the day itself you will be able to sit back and relax while we supervise the set-up of the ceremony and reception ensuring everything unfolds according to plan from “I do” to your first dance as a married couple and enjoy the rest of Your Bali Wedding! Your dream location, your dream day, your way... and we do all the work. By filling in this form it allows us to know more about your dream wedding and assist you in creating it.